Offering you a complete choice of products which include three phase rectifier, single phase servo stabilizer 5 kva, dc power supply, dv-dt limitation of scr trainer kit, study of triac and a.c. phase control and scr regulated d.c. power supply. Owing to our expertise in this domain, we are engaged in providing an array of Three Phase Rectifier. Acknowledged for its three different color neon indicator which is given for indication, the offered rectifier is designed using high quality factor inputs and the innovative technology. The offered rectifier is widely demanded for its performance & quality. Additionally, the offered rectifier can be availed by our customers at competitive rates. We are the leading manufacturer, trader, and supplier of an exclusively designed Single Phase Servo Stabilizer 5 KVa. This consists of automatic two steps Buck-Boost Principle, the offered stabilizer trainer is given in various specifications to choose from. This stabilizer trainer is designed using innovative technology in comply with the international quality standards. The offered stabilizer trainer is given in several customized specifications according to the various needs of our customers. Owing to our expertise in this domain, we are engaged in providing an array of Dual DC Power Supply. 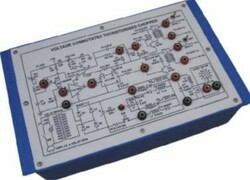 Our offered Power supply is designed using excellent quality components under the direction of experts. 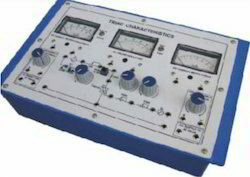 This Power supply is also checked on several quality parameters to assure its flawlessness. Owing to their outstanding quality & performance, our offered Power supply is broadly valued by our customers for their application requirements. Power Electronic Training Board has been designed specifically to study the Dv/Dt characteristics of SCR. It is essential to improve the Dv/Dt capability of SCRs to avoid false firing which may be disastrous in some applications. Different schemes given on the board, help the students todesign and study various snubber circuits to improve the Dv/Dt capability of thyristors. Thyristor switch for applying sudden voltage on the SCR under experiment. Resistance for gate-cathode termination.05. Silicon diode.06. Transistorized snubber circuit. Two schemes for R-C snubber circuits. Visual indication to indicate SCR firing.09. Adequate no. of other Electronic Components.10. Mains ON/OFF switch, Fuse and Jewel light. 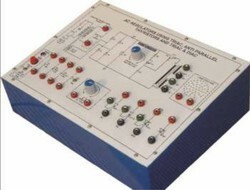 Power Electronic Training Board has been designed specifically to study the characteristics of a TRIAC and its application as A.C. Power Control using phase control technique. The unit is provided with built-in load facility. 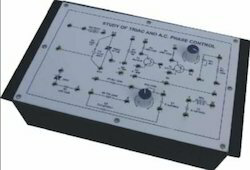 Experiments for the study of radio frequency interference in phase control and methods of their suppression, can be conducted on this training board. Power Electronic Training Board has been designed specifically for the study of continuously variable SCR Regulated Power Supply. The power supply can be manipulated to operate under different circuit conditions in order to provide insight into the important modes of SCR power supply operation. The output voltage can be varied from 10 to 40 Volts continuously. The power supply can also be used as a stabilised source to feed external load up to 500mA. Internal loads are provided to test the performance in 16 steps. 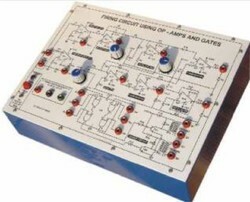 Power Electronic Training Board has been designed specifically to study various switching techniques of TRIAC - a bidirectional silicon controlled switch. 01. An isolation transformer 230V A.C. 250mA. This protects external instruments from damage if they are not isolated. 02. 12V D.C. at 250 mA, IC Regulated Power Supply for D.C. Triggering. 03. 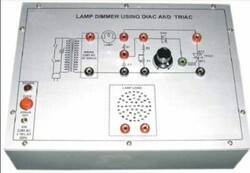 The TRIAC under experiment. 04. Two push button switches for triggering. 05. UJT 2N 2646 connected in relaxation oscillator mode to provide triggering pulses. 07. NPN Transistor for UJT control with external transducer. 08. Lamp holder with 40 Watt lamp for load in power control indicator. * Adequate no. of patch cords stackable 4 mm spring loaded plug length ½ metre. * Good Quality, reliable terminal/sockets are provided at appropriate places on panel for connections/observation of waveforms. 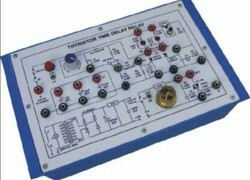 Power Electronic Training Board has been designed specifically to study the operation of SCR and TRIAC triggered by electronic time delay circuit. 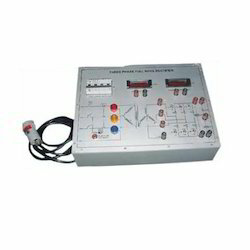 This facilitates to perform the experiment to students both the modes of operation-delayed turn on and auto turn off to control any type of load i.e. A.C. or D.C.
12V D.C. at 2 Amp, Power Supply internally connected. UJT 2N 2646 used as timer. Potentiometer for ramp control to adjust time delay. Set of 3 Capacitors for time delay control. Two SCRs connected in parallel coupled mode. Push button switch for starting. TRIAC for A.C. line switch. Power Electronic Training Board has been designed specifically to study the applications of SCRs in electronic alarm circuits. The high power gain, low leakage currents and high current carrying capacity of SCRs make them ideal for such applications. This training board is an important set up to study various configurations and designs of electronic alarm circuits. The board is absolutely self contained and requires no other apparatus. 12V D.C. Power Supply internally connected. Push button switch for push to break demonstration. Push button switch for push to make demonstration. One PNP and two NPN transistors for electronic alarm control. Two PNP transistors connected in differential amplifier mode for light and temperature sensing. Potentiometer for time delay control. Potentiometer for balance of differential amplifier. ON/OFF switch for 12V D.C. stand by and reset. LDR for light sensing and thermistor for temperature sensing. 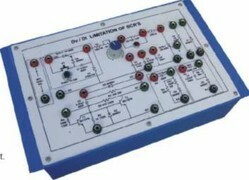 Power Electronic Training Board has been designed specifically for the study of SCR Triggering circuits. Power Electronic Training Board has been designed specifically for to study A.C. Regulators using triac, antiparallel thyristor and triac & diac. 01. 230V A.C. Isolated Transformer, Power 50 Watt. 02. 9V D.C. at 100mA Zener Regulated Power Supply. 03. Two silicon controlled rectifiers (SCR’s). 04. Uni Junction Transistor (UJT). 08. Two potentiometers one for controlling UJT firing angle & other for varying load. 09. Bulb 40W, 230V A.C.
* Mains ON/OFF switch, Fuse and Jewel light. 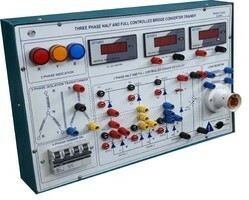 Power Electronic Training Board has been designed specifically for study of single phase PWM converter. 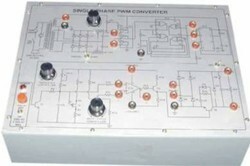 Power Electronic Training Board has been designed specifically for the study of the firing circuit for single-phase converter using Ramp Comparator Scheme. 01. 6V AC at 100mA AC Power Supply. 02. ±12V DC at 100mA fixed regulated Power Supply. 04. Quad, Ex-OR gate IC. 05. Triple, 3 input AND gate IC. 06. Hex inverter gate IC. 07. Quad, two input AND gate IC. 09. Potentiometer for reference voltage adjustment. 10. Pulse Transformer 1: 1. 11. Adequate no. of other Electronic Components. 12. Mains ON/OFF switch, Fuse and Jewel light. * Adequate no. of patch cords stackable 4 mm spring loaded plug length ½ meter. Power Electronic Training Board has been designed specifically for the study of the firing circuit for single-phase converter using Op-Amps and Gates. Quad 2 input AND gate IC. Power Electronic Training Board has been designed specifically for study of the Single Phase Series Inverter. Triac as a static switch (D.C. control). Control of A.C. with A.C. signal. To measure the holding current of IH. Triac. Leveraging the high industry experience, we are engaged in providing a wide assortment of Inverter Trainer. The offered inverter trainer is designed utilizing top grade material and latest technology, in compliance with the quality standards. Our offered inverter trainer is checked by quality controllers to deliver a flawless range from our end. Moreover, we provide this inverter trainer in several specifications that can also be customized as per needs of our customers. 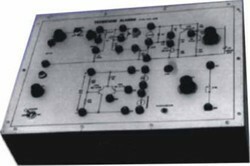 Power Electronic Training Board has been designed specifically for the study of the firing circuit for single-phase converter using cosinewave comparator scheme. 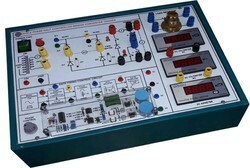 Power Electronic Training Board has been designed specifically for the study of three phase full wave rectifier. 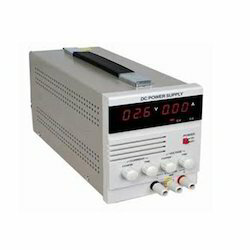 Digital Panel meter 3½ digits range 200V to measure the DC output voltage. Digital Panel meter 3½ digits range 200mA to measure the d.c. load current. 3 pole power contactor with AC coil complete with push to ON switch. Four pole Miniature Circuit Breaker (MCB). Three different colour neon indicator provided for indication . 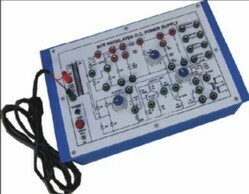 Power Electronic Training Board has been designed specifically for to study the forced commutated circuits. 30V D.C. at 150mA Fixed Power Supply. 5V D.C. at 50mA Fixed Power Supply. UJT Triggering Circuit for SCR’s. 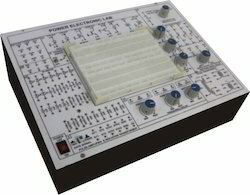 Power Electronic Training Board has been designed specifically to study Lamp Dimmer Using Diac and Triac.The board is absolutely self contained and requires no other apparatus. Potentiometer to control intensity of Lamp. 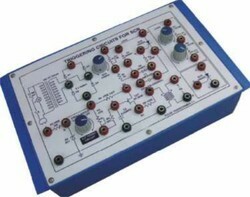 Power Electronic Training Board has been designed specifically to study trigger of a SCR by using a LDR.Practical experience on this board carries great educative value for Science and Engineering Students. Power Electronic Training Board has been designed specifically for the study of the step down voltage commutated thyristorised chopper. ±12V D.C. at 100mA IC regulated power supply internally connected. Bridge Rectifier for making D.C. voltage.